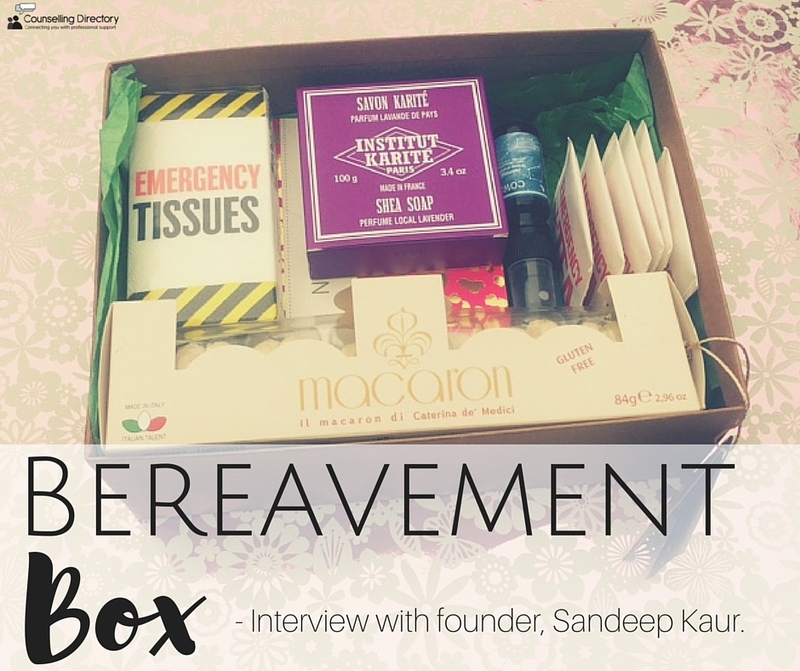 We interview Sandeep Kaur, founder of Bereavement Box. When someone you know loses a loved one, it can be difficult to know what to do or say. In these circumstances, simply showing you are there for them when needed goes a long way. For many of us, an easy option to show you care is to send a gift, traditionally flowers or a card. But what if you want to send something different? Something a little more personal? Sandeep Kaur came up against this very question and created Bereavement Box, a range of boxes full of thoughtful gifts for those in need. 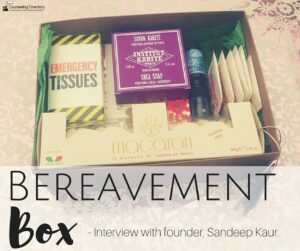 Below we ask Sandeep some questions about the bereavement boxes. First of all, can you tell us a little about what sparked the idea for the Bereavement Box? This is probably how a lot of successful ideas come about, it came from a need! Sadly, a few months ago a friend of my mother’s husband passed away. I felt overwhelmed with sadness for his widow who lost her husband so early into their marriage. She wasn’t a close friend and the circumstances of his death made it inappropriate to visit. She lost her parents early and I was very aware she may have felt alone. So, I scoured the Internet to find something more than flowers, something that would provide comfort, reassurance and actual practical advice. There was nothing! There were sympathy gifts, but these were full of cutesy goods like chocolates or beauty kits that are nice but have a less than tangible purpose. I wanted something practical, something that would be useful and further the grieving process. So that’s where I thought of Bereavement Box. They’re more than just ‘nice things’, they’re proactive. Each item has a function. Useful in getting that individual through an extraordinarily difficult time. Can you explain the concept and when someone might use it? It’s of course aimed at people who are bereaved. We recommend it’s best sent after any funeral arrangements as I feel that’s the point the grieving process begins. The beauty of the box is that’s it’s a concept that translates to a number of situations. 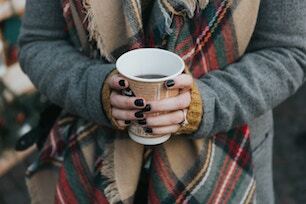 There are circumstances like grief where one can feel completely alone. I myself struggled with depression and in that time a friend sent me a care package and a card and it meant the world to me. The card enclosed is still on my night stand today. I’d love to be a part of making people feel as loved as I did at that moment. I think it’s perfect for any time that one feels like they need an emotional cuddle. How did you decide what to put in the boxes? Well I did a bit of research and spoke to people who suffered loss. I feel an emotional book about death is good for the soul. It creates solidarity, shows how normal and cruel grief is. It’s also justification for a good cry. I am also aware that people can often lose appetite in times of grief. In such circumstances I am hoping that something appetising in the box can remind the bereaved of the pleasure of food and the comfort it brings. Other such motivations can be found on the website. But overall, I really want to encourage the bereaved to make time for themselves, to not run away from their sadness. 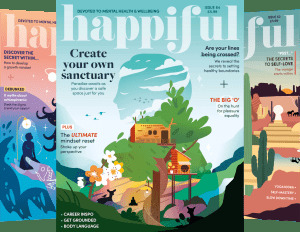 To encourage mindfulness and acknowledge their sadness. We love the way the boxes can be personalised, can you explain more about this? Well in one sense this is a practical matter, we don’t want bereavement box plastered across boxes of people who are simply unwell! But it’s important to have a personal message. In the box I received it was the card that meant the most. Death is hard and it hits everyone differently. Triggers vary from person to person and we need to make sure what we offer is appropriate. If we are unsure we will always get in contact to check. There are three different boxes available, find out more about what’s inside and shop over on the Bereavement Box website.